Chic floral advice cards let bridal shower guests share their favorite words of wisdom for the bride to be. 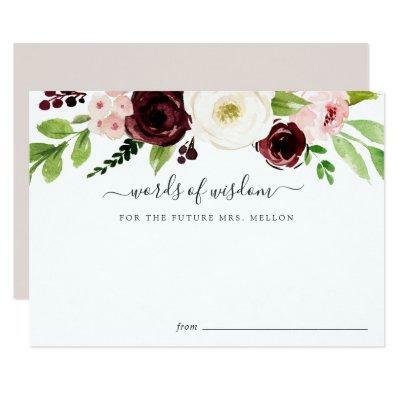 Cards feature a top border of blush pink, ivory and burgundy watercolor flowers with lush green botanical foliage. "Words of wisdom for the future Mrs. [Name]" appears in modern hand lettered calligraphy script. Designed to coordinate with our Blush Romance event stationery collection.